Thomas Edison wrote the date – November 29, 1877 – in the upper right-hand corner of the piece of paper on which he had drawn the sketch of his design for a new invention. 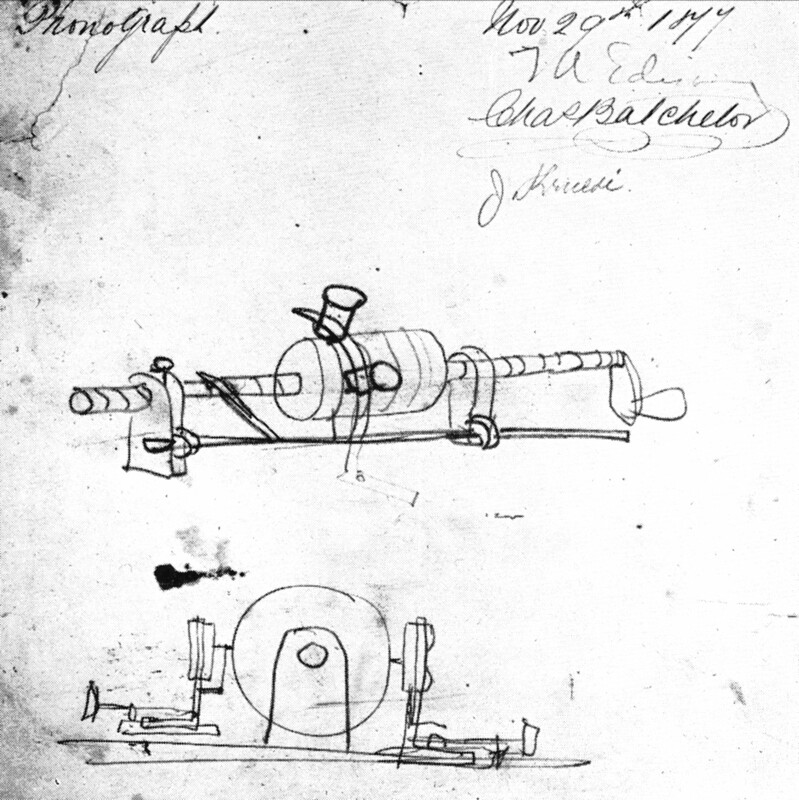 Edison gave the sketch (shown above) to John Kruesi (1843 – 1899), the Swiss-born machinist that he considered to be the best in his employ at Menlo Park. 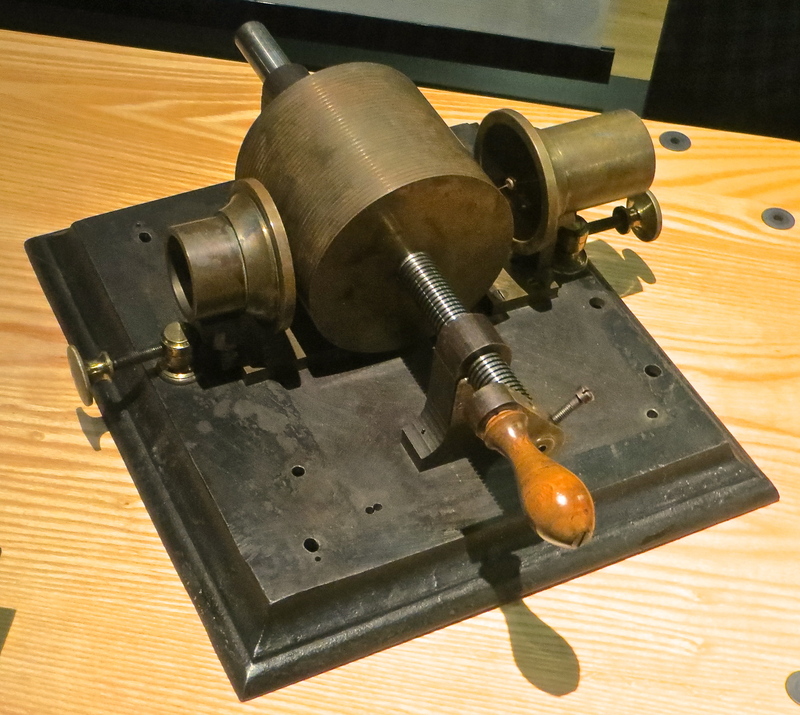 In early December of 1877 (possibly as early as Tuesday, December 4), John Kruesi presented Thomas Edison with the finished prototype of his phonograph. Here is a photograph of Thomas Edison’s first phonograph as displayed at Thomas Edison National Historic Park in West Orange, New Jersey. The “cylinder provided with grooves around the surface” is in the middle of the machine. The cylinder’s surface is inscribed from end to end with a helical or spiral “indenting groove.” A screw-threaded shaft runs length-wise through the center of the cylinder. Each end of the shaft is held by a vertical support, keeping the cylinder suspended above the base plate. A wooden crank handle is attached to one end of the shaft. When the crank is turned, the cylinder/shaft unit simultaneously rotates and moves horizontally between the two vertical supports. To the right of the cylinder stands the mouth piece or “speaking tube.” A metal diaphragm with a metal “indenting-point” attached to its center covers the end of the speaking tube closest to the cylinder. To the left of the cylinder is the shorter “reading tube.” This tube is also outfitted with a metal diaphragm and an attached indenting-point on the end facing toward the cylinder. 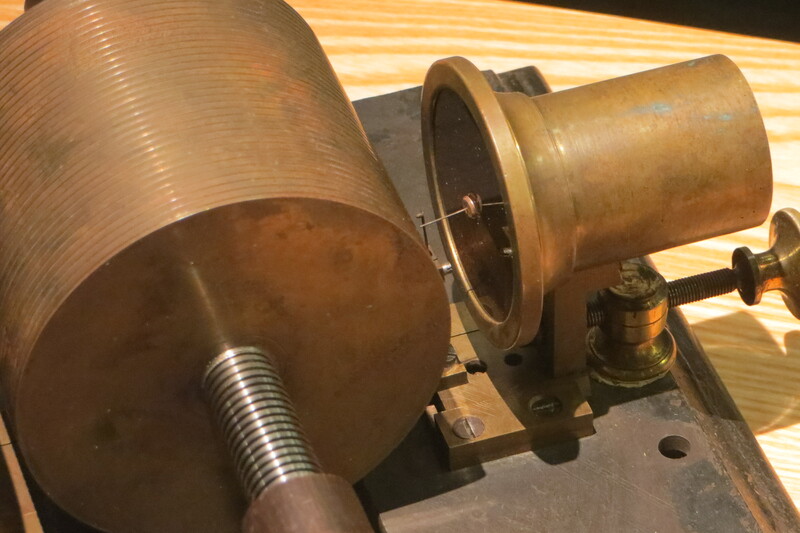 Here’s a close-up of the speaking tube and part of the cylinder and the threaded shaft. Position the cylinder so that the beginning of the indenting groove is opposite the indenting-point on the speaking tube’s diaphragm. Wrap a thick sheet of tinfoil smoothly and completely around the cylinder. Adjust the speaking tube towards the cylinder so that its indenting-point makes contact with the tinfoil and presses the tinfoil slightly into the indenting groove. Begin turning the crank handle. Lean over and speak loudly into the open end of the speaking tube. The resulting sound waves within the speaking tube cause its diaphragm to vibrate. The indenting-point pulsates in and out against the moving tinfoil, forming a continuous trail of hill-and-dale-like indentations along the track provided by the indenting groove on the rotating and horizontally-moving cylinder. When finished, the “recording” of the sound of the operator’s voice will lie in the spiral groove that has been “easily received” by the tinfoil. Adjust the speaking tube back away from the cylinder. Turn the crank in the opposite direction until the cylinder is rewound to its original position. Adjust the reading tube towards the cylinder so that its indenting-point is resting in the beginning of the spiral groove inscribed into the tinfoil. Turn the crank handle in the same direction and at the same speed as during the recording process. As the cylinder revolves, the indenting-point of the reading tube’s diaphragm traces the hill-and-dale-like indentations in the groove on the tinfoil. The diaphragm vibrates and the reproduced sound of the operator’s voice emanates from the open end of the reading tube. “Anyway, that’s the plan,” Edison might have concluded. The very first time Thomas Edison tried his phonograph – he recorded himself reciting the poem “Mary Had A Little Lamb” – it worked. “I was never so taken aback in my life,” Edison later recalled. “I was always afraid of things that worked the first time; but here was something there was no doubt of.” Thomas Edison’s first phonograph showed “that speech and song could be actually recorded, preserved and reproduced” by the same machine. On December 24, 1877, the United States Patent Office received and recorded Edison’s application. On February 28, 1878 and on March 19, 1879, Thomas A. Edison would execute applications for – and eventually be awarded – two more patents for inventions involving the phonograph and speaking machines. By the summer of 1879, however, Edison had completely set the phonograph aside and was focusing his energy on perfecting the incandescent lightbulb. Not until 1887 would Thomas Edison turn his attention back again to the phonograph. Working then in his new and much larger laboratory in West Orange, New Jersey, Edison would be awarded (from May 8, 1888 to May 16, 1933) another 196 patents for inventions concerning phonographs and sound recording. In conclusion, here is one more quote from Thomas Edison. 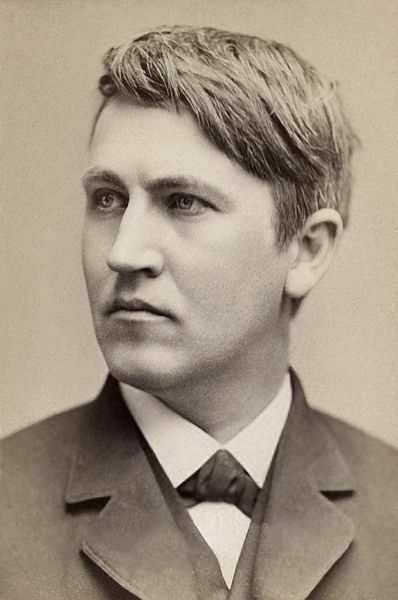 Thomas Alva Edison passed away on October 18, 1931 at “Glenmont,” his home in Llewellyn Park, West Orange, New Jersey. “How Edison Invented The Phonograph” (1922) – an advertising booklet produced by Thomas A. Edison, Inc., Orange, New Jersey. 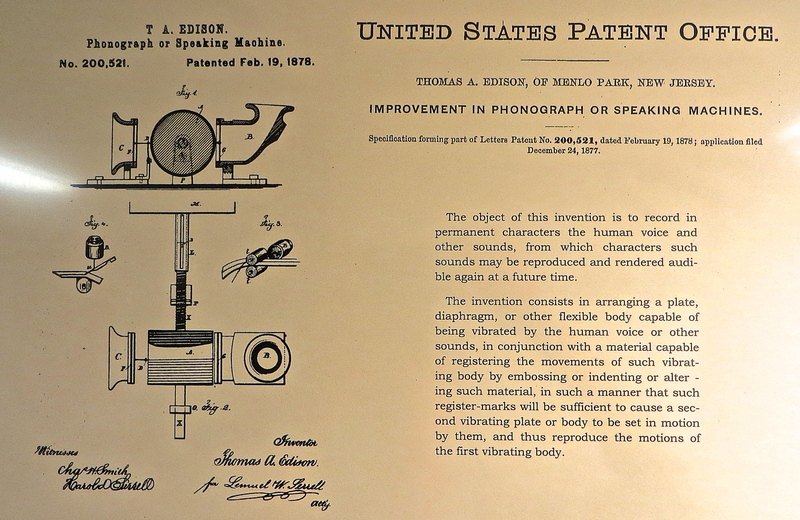 The text of Thomas A. Edison’s patent application for “Improvement In Phonograph Or Speaking Machines” (December 15, 1877) – as found on the Rutgers University website, The Thomas Edison Papers, at: edison.rutgers.edu. Famous Quotations from Thomas Edison at: thomasedison.org. My late-August, 2014 visit (with my cousin, Jack) to The Thomas Edison Center at Menlo Park in Edison, New Jersey and Thomas Edison National Historical Park in West Orange, New Jersey. This entry was posted in Random Topics and tagged John Kruesi, Menlo Park, Phonograph, Scientific American, Thomas Alva Edison, Tinfoil Phonograph. Bookmark the permalink. An amazing man, Edison. 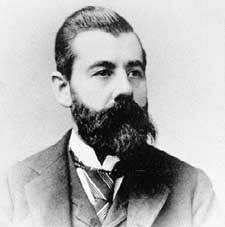 We can only wonder what would come out of his head today, given the state of the art and technology. 1877 – Edison patents the hand cranked phonograph machine which records and plays back voice. 1977 – “Star Wars” premiers. Cultural issues aside, what do you think visionaries like Edison, Bell, Edwin Land would think of the advances in their respective technologies?